Pinoy Arroz Paella. The main dish of our Noche Buena is paella and it has become a family tradition. 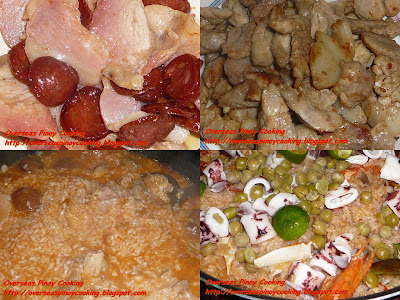 I would like to share to every one my version of paella, thru the years I have tried to improve the recipe. I have used only ingredients that are available locally, locally means available even in your local wet market. Cooking procedure is fairly easy an average housewife can easily cook the dish. There are no special cooking procedures. I am now posting the dish in advance and in time for every one to prepare it should you choose to have a paella in your Noche Buena. Here is the recipe. Enjoy. Rub chicken and pork with a dash of paprika salt and pepper and let stand for 10 to 15 minutes. In a wok heat oil, brown chicken and pork on all side, set aside. Fry chorizo until it start to sizzle, set aside. Fry ham until it start to sizzle, set aside. Sauté garlic and onion, add tomato, roasted bell pepper, add 1 cup of water, stir cook until most of the liquid has evaporated and turn into an oily thick sauce. Add in rice and remaining paprika, stir cook for 3 to 5 minutes or until rice is coated and infused with the sauce and tinted with bright orange. Add pork, chicken, ham and chorizo, stir cook for another 2 to 3 minutes. Add in 2 cups of broth from boiling the seafoods and 2 cups or water. Cover and bring to a boil then cook the rice at low heat. When rice is halfway done, stir in the seafoods and season with salt to taste. Now place on top squid, green peas, kalamansi and bell pepper. Cover and allow the rice to finish cooking with out stirring for 20 to 30 minutes. Transfer paella in a platter arrange meat and seafood on top, garnish with wedges of hard boiled eggs.